We are pleased to come across a Danish invention that implements ideas from nudging into a fun tool for saving energy at home. It is called WaterGuide and is a perfect example on how you can nudge yourself to spending less energy while having fun. The invention is an attachment to your mixer tap in the shower. After installment it gives you live feedback – audibly with some encouraging sounds bites during your shower and visually on a little screen. The visual feedback consists of a lit up background in the easily recognizable traffic light colors (red, yellow and green) as well as animated smileys. 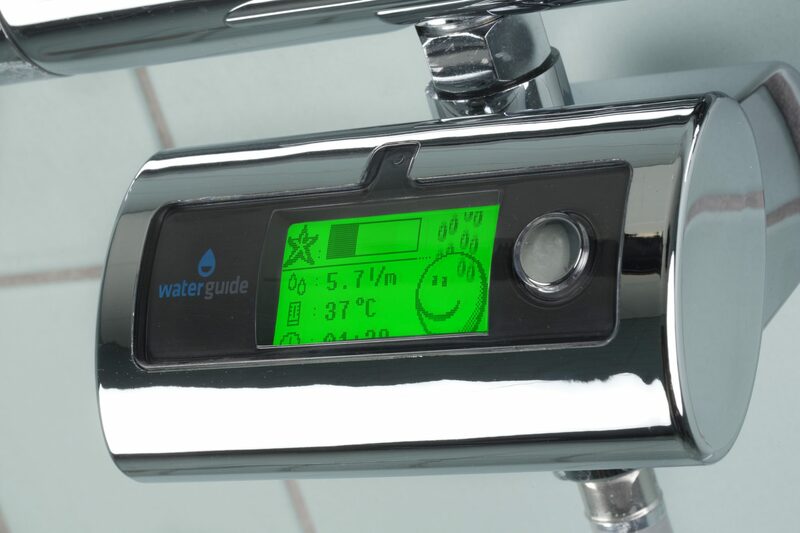 It measures not only the amount of water running through the device, but also the water temperature in order to communicate the overall consumption of energy. WaterGuide has been tested on 35 families and on average the implementation resulted in a cut of 30% of the households’ water consumption. Needless to say that on average, the WaterGuide holds the potential of saving households a substantial sum of money, depending on water source and type of heating used. The WaterGuide qualifies as a nudge, since it changes people’s behavior in a predictable way without limiting the choice set and without adding economic incentives (except if the household has agreed on some sort of penalty/prize to whoever spends most/least energy). There are several features in this nudge that are worth mentioning. First of all, just like the Wattson Clock, the WaterGuide gives immediate feedback on how much your behavior is affecting your energy consumption. And since the information is presented in a form that is recognizable for adults and kids alike, you do not have to wait for the energy bill with the total energy use in order to gain useful information of your household’s behavior. Furthermore, the smileys, traffic-light colors and sound bites directs your decisions and behavior, since they all indicate a comparative level of consumption. And more importantly, they are doing this by drawing on widely recognized signs of behavioral approval or disapproval. That is, the traffic-light colors, the smileys and the encouraging sound bits provides information that suggests a behavioral change – but does not force you to do so. Figure 1. The display when the energy consumption is low. On top of that lies the action directing aspect of comparing the individual family member’s energy consumption while showering with the rest of the family. After each use the screen shows a row of bars that represent the energy spend in the latest shower of each family member. This introduces an element of social comparison and reveal if your energy usage deviate from that of your family members. This element of comparison introduces a possibility of conforming to an agreed upon norm. This is clever, since, as we previously have discussed, norms and social comparison are powerful means to behavioral change. This little row of bars with comparable information also opens up the possibility for competition between the family members – such a competition is part of a gamification principle and is as such an addition to the nudge described above. The idea behind gamification is to add elements best known in computer and console games into other contexts in order to yield a behavioral change. At least in its purest form, gamification entails goal substitution, i.e. substituting the goal of an action from whatever the outcome of the action was to the outcome of ‘the game’ (bananas, badges, tokens, you name it) which sometimes include the possibility of advancement in levels (from novice to expert). We have previously commented on the piano stairs – one example of goal substitution, where the goal of achieving the healthy benefits from using the stairs was substituted with the amusement of making each step produce the sound of a piano note. Although we were not too keen on the piano stairs, goal substitution and gamificaton might hold a potential for changing behavior in a meaningful and long lasting way. Just take the example of the the WaterGuide: the gamification aspect is relatively weak, in the sense that it does not entail a completely substitution of goals – the bars comparing energy usage merely enables the family members to engage in a competition – it does not dictate that such competition takes place. 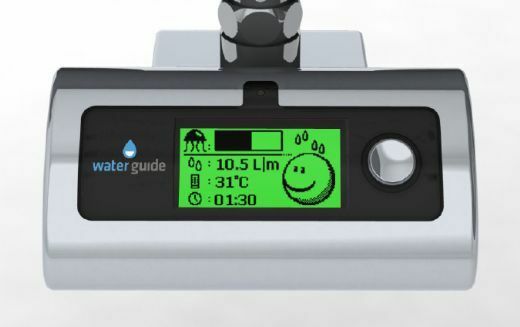 Overall, the design and idea behind the WaterGuide is very clever and holds potential for lasting behavioral change.